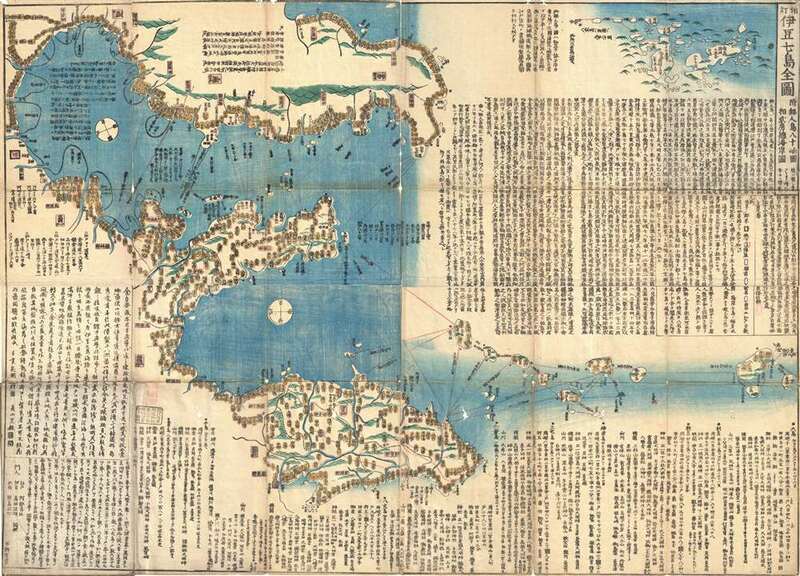 Early Japanese nautical map of Tokyo's Izu Seven. An extraordinary find, this is a c. 1847 Tokugawa Period Japanese woodblock nautical chart of the Izu Islands (伊豆諸島 Izu-shoto). Oriented to the East, this map covers from Chiba, Kanagawa, and Sagami Bay southwards as far as Miyake and Mikurajima Islands. Traditionally referred to as the 'Izu Seven' (伊豆七島 Izu Shichito? ), the Izu Islands are officially part of modern day Tokyo. Though many are uninhabited nature preserves, some of the Ize Islands host large town and villages. This map notes the locations of various shrines, towns, rivers, temples, and identifies local production specialties. With minimal inland detail this map can best be interpreted as a traditional Japanese nautical chart. Notes nautical routes and many offshore features including dangerous reefs and shoals. Though undated the latest information on this map dates to 1847 and the whole is stylistically consistent with our advertised date of c. 1847. Very good. Some fold splits exhibit verso repairs. Folds into original paper binder.